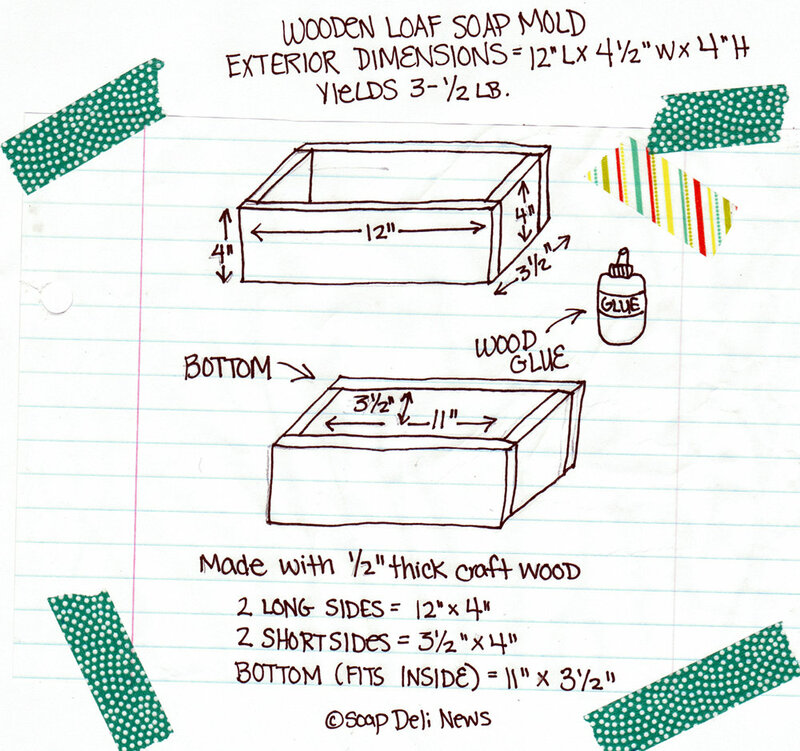 I’ve had some people ask me how to make a basic wooden loaf soap mold for cold process soap, so I thought I’d share a tutorial on how to make your own soap molds. 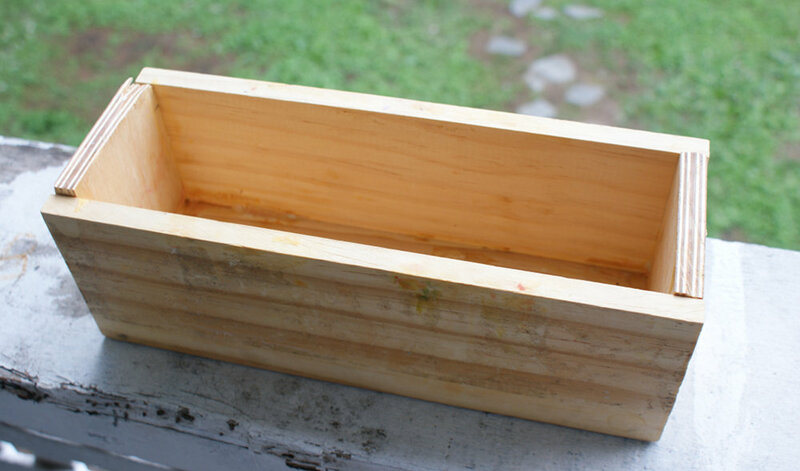 This wooden cold process loaf soap mold is so easy to make and it will last forever. My dad is handy with wood and power tools so he made me a bunch of these, however, if you don’t own power tools, it’s possible to get the pieces for the molds cut at no charge. Each of these homemade cold process soap molds will hold approximately 2.75 lbs. of (cured) soap and will make approximately 10-12 4oz. bars depending on how large you cut them. If you’re having trouble figuring out how much your soap will weigh once cured, my average recipe for one of these molds uses 36oz. in oils & butters (fats) prior to adding the lye/water, and fragrance. 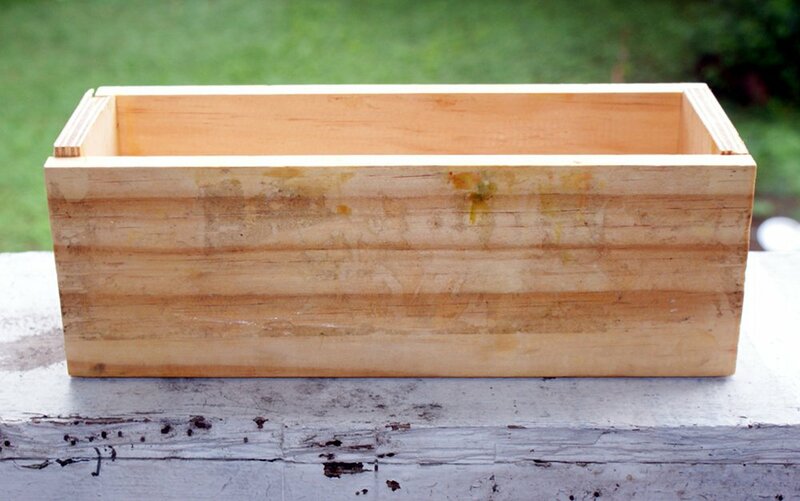 To create one mold you’ll need to use wood that is 1/2″ thick. I used craft wood from Lowe’s. I have been told that if you are buying wood that an associate at Lowe’s will cut it down into the dimensions you use if you ask. For the two long sides, you’ll need to cut two pieces of wood that measure 12″ x 4″. 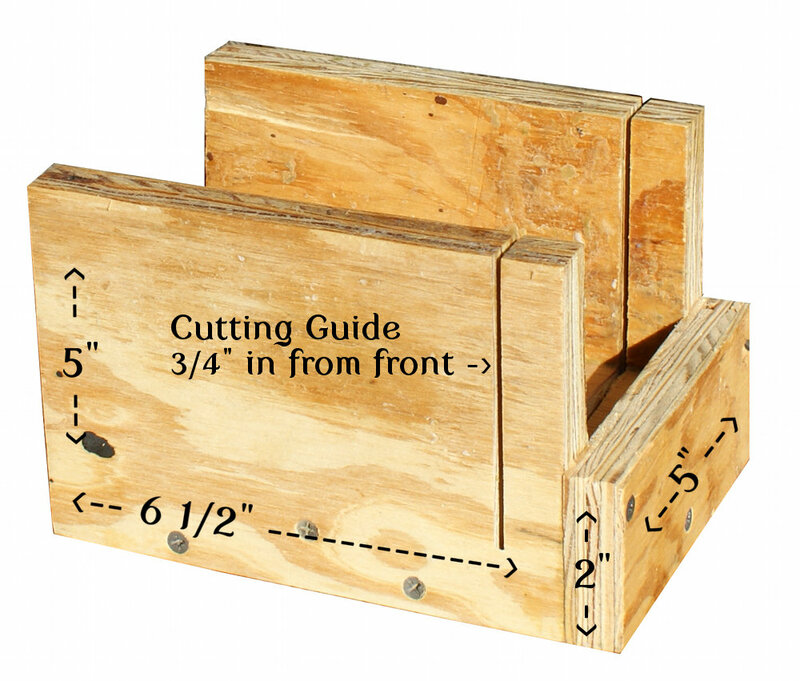 The two short sides should be cut to 3 1/2″ x 4″ and the bottom piece of the mold should be cut to 3 1/2″ x 11″. The final dimensions of the soap mold will measure (from the outside) 12″ Long x 4 1/2″ Wide x 4″ High. 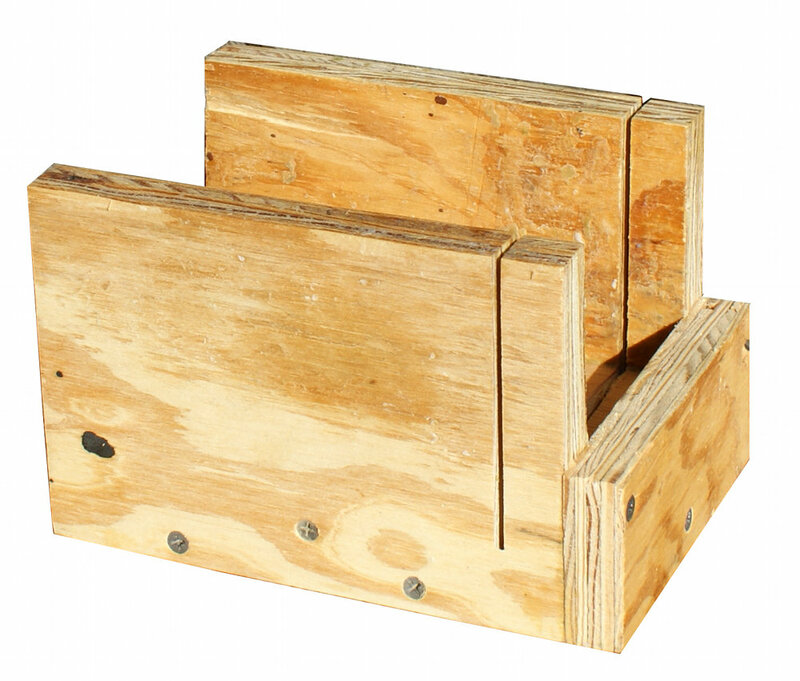 You’ll need to use wood clamps and wood glue to assemble your mold as pictured above. The two short sides fit on the inside of the two longer sides to form a rectangle and the bottom piece of the mold fits on the inside bottom of the mold. Use glue and clamps to hold the pieces together until dry. If you don’t have clamps or want to add extra reinforcement, you can use a cordless screwdriver to place screws where the sides connect. Making a lid for these is optional. Honestly I’ve never needed to use a fancy lid as cutting cardboard to fit on top of the molds works just fine during the curing process. I simply place cardboard on the top of the filled mold and then cover with towels to insulate during the 24 hour saponification period. Lining your soap molds before use is essential to being able to get your soap out of the mold. If you don’t line your mold, your soap will get stuck. I used to cut parchment paper to line my molds as demonstrated in this the same process that this tutorial by Inner Earth blog uses with contact paper. Basically you fold the paper in a way that is similar to wrapping a present but with an open top. However, parchment paper and contact paper can be expensive and the process for lining molds this way can be tedious and time consuming especially if you are making multiple or large batches at once. Because of this, and due to the stiffness and occasional pain in my hands from the fibro, I use trash bags to line my molds. If you’re practical and don’t mind a few minor creases on the sides and bottom of your soap, then this method may be the one for you. I got this ideas from another local soapmaker who I used to sell alongside at our local Farmer’s Market. She used large 20 gallon kitchen trash bags to line her molds, then once she unmolded the soaps, she’d re-use the trash bags for actual trash. (Plus the soap gave them a nice, fresh scent.) What I use are thin, clear office trash bags. I bought a huge box of 1000 10 gallon light duty commercial trash bags to line my molds with as they a lot less expensive than parchment paper and can be used again for my office trash. (They are super cheap at Sam’s Club and office supply stores.) 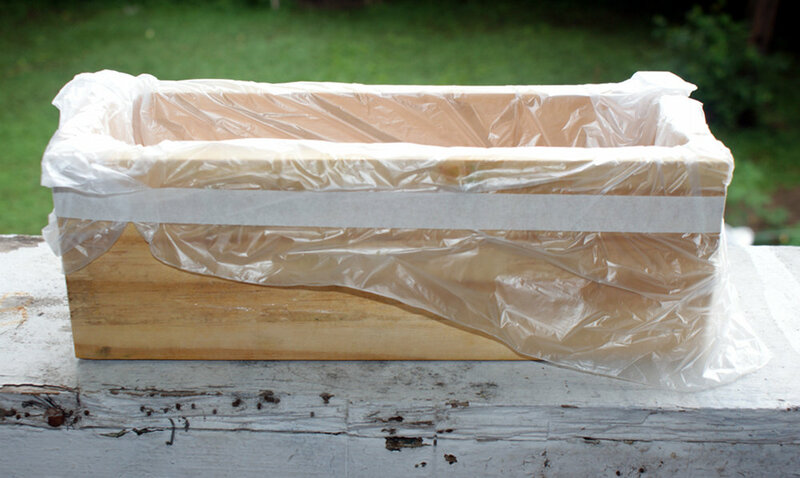 To line a mold I simply unfold the bag – but don’t open it – press it into the mold and then tape the outer edges where the bag folds over the outside of the mold to keep it in place. This method is gentle on hands and super quick. I can now line all nine of my molds in 5 minutes or less. Of course, how you choose to line your molds is personal preference. I recommend doing whatever works best for you. 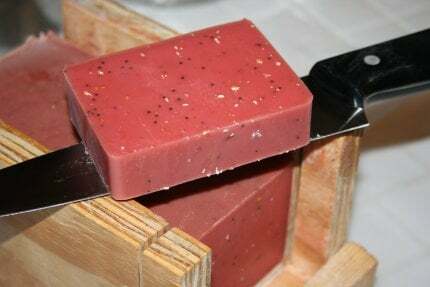 Once your soap has set you simply lift the soap from the mold and peel off the liner, cut into bars and allow to cure a minimum of 3-4 weeks. To use these molds for melt and pour glycerin soap, simply line with trash bags as indicated for cold process soap. On a side note, I wanted to share with you where to buy sodium hydroxide (lye) for making your soap. You used to be able to buy Roebic brand lye from Lowe’s. 2lb. ran $8.99. Several months ago I noticed that their price for a 2lb. container of Roebic lye had gone up to $16. Recently, they stopped carrying it all together. I imagine this has something to do with the illegal meth labs that seem to be sprouting up everywhere. Therefore what I recommend is to look in your local yellow pages for a local chemical supply company. I am lucky enough to have one in my hometown called ChemSolv. ChemSolv sells 99% pure sodium hydroxide (which is suitable for soapmaking) in 55lb. bags. These bags with tax – in case you don’t have a resale license – runs $38 and change. They currently have locations in Roanoke, VA (my hometown), Colonial Heights, VA, Piney Flats, TN and Rock Hill, SC. I purchase what they call caustic soda beads. If you don’t have a chemical supply store near you, you can buy 2lb. containers of Food Grade Sodium Hydroxide from Amazon . Even with shipping, these containers run cheaper than 2lb. containers of Roebic brand lye from Lowe’s – assuming your store still carries it. Plus, currently if buy 5 2lb. containers of lye, you receive $5 off your purchase. You can also find Potassium Hydroxide Flakes for liquid soapmaking available through the same company through Amazon with the same deal. Other brands of lye you can use include Red Hot Devil Lye Caustic Soda Beads and RED CROWN High Test Lye . Want to give a special, personalized gift for Valentine’s Day this year? Create a custom handmade name sign for someone special in your life! 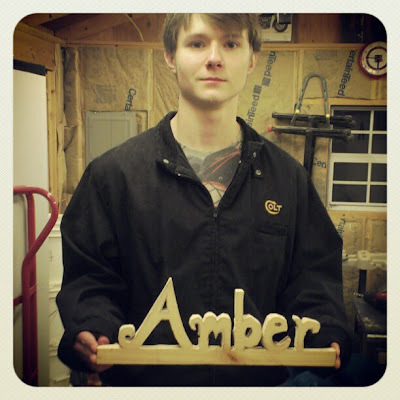 My son, Cody, made a personalized name sign for a girl he knows at school. Here’s how he did it. Start by selecting a piece of wood that is around 3/4″ to 1 1/2″ thick. 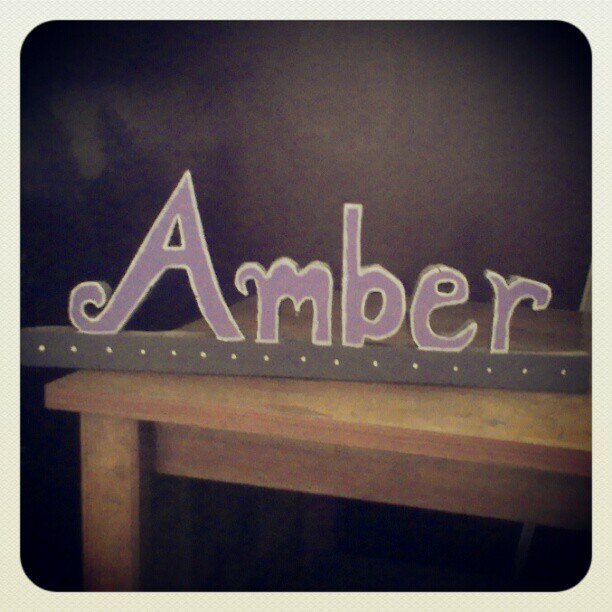 This will allow your name sign to stand on it’s own on a surface or at the top of a door or window frame. 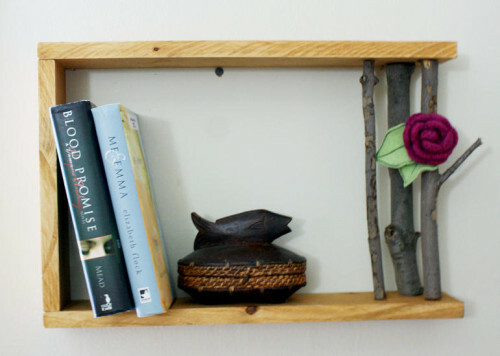 This is a great use for any scrap wood you may have on hand. Then draw your design onto the piece of wood you’ve chosen to use. Next, carefully cut out the name using a jigsaw. 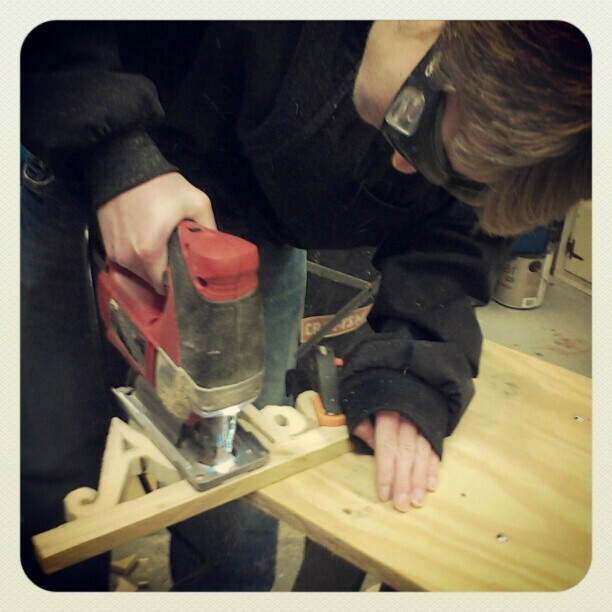 Once you’ve cut out the letters for your sign, you may want to sand the edges so there are no rough edges. Once you’ve cut out and sanded the sign, it’s time to decorate it. Cody opted to stain the sides and the back of his sign. For the front of the sign, Cody applied purple, gray and white non-toxic acrylic paints. 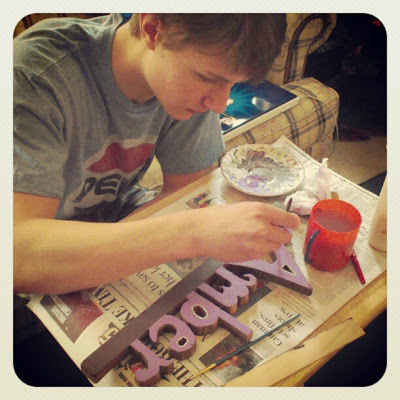 He painted the bottom base of the sign with gray paint and the letters of the name with purple paint. Finally he painted around the edges of the letters with white paint and added a row of dots in white paint to the base of the sign. 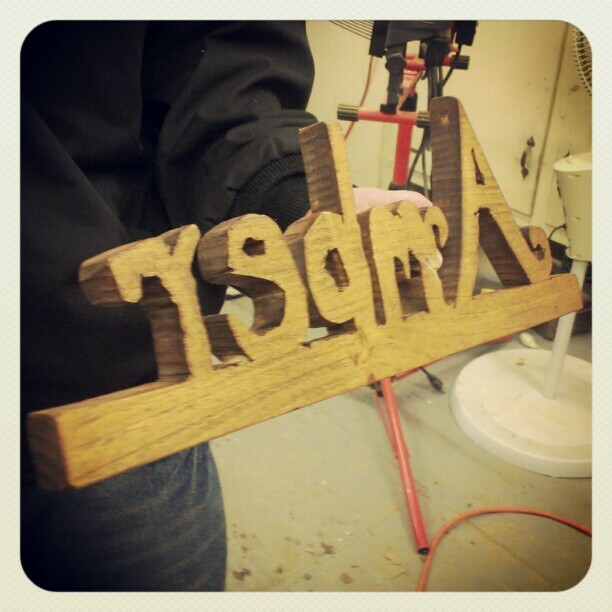 Who would you make a personalized name sign for?